When environmental image determines market share economies will work for the environment and climate targets will become achievable. The world is largely aware of incipient climate problems but moving far too slowly to avert them. We make the environment = market share connection whilst providing an entertaining public education. There’s strong public goodwill but an aversion to lifestyle compromises. Purchasing from the more environmentally positive in a pain free way to show care. Once market share is seen as contingent upon environmental image capital will flow into the sector and resistance crumble. In the scramble for profits the world’s economic direction will change and the technologies upon which our fate rests will flourish. Concurrent with economic redirection we also educate in a non-confrontational, entertaining way. Good habits can be learned and are most effective when voluntarily adopted. The aim is to change economic priorities and modify human behavior so we work with human drives. The environment engenders world-wide goodwill (#1) however people value their lifestyle more and are usually focused on the immediate future. Shopping from the more environmentally positive is an easy ask. There’s no sacrifice of lifestyle required and it’s effective, even when purchasing less environmentally desirable goods however motivating it requires a sophisticated approach. 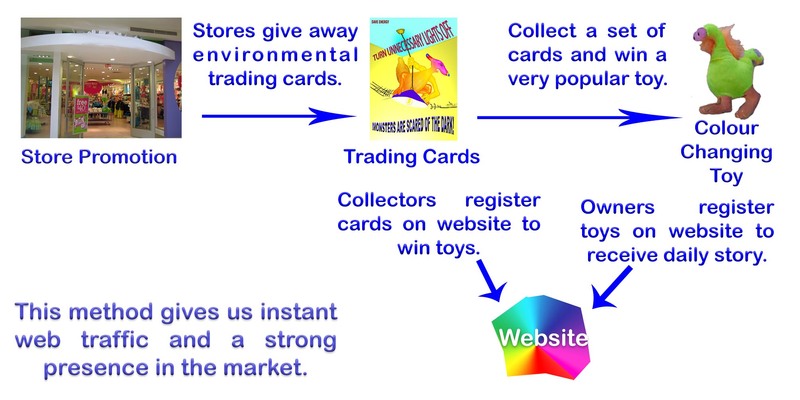 First we attract attention via a chain store giveaway of environmentally themed trading cards. Collecting a set of cards wins a very popular toy (to be collected from the store) with an environmental back story. This leverages the store’s customer base to give us instant web traffic because cards must be registered on our site to win the toy and it gives us a presence in schools. It works for stores because the promotion is ongoing and particularly effective. An outline sent to a major Australian supermarket received a positive return call within an hour. Kids collecting the cards and toys will, inevitably, take them to school to show and swap and teachers, as always, will check what their students are looking at. For once they’ll find something they can use themselves. Teachers will discover curriculum based competitions and contests with useful prizes for schools and themselves. It’ll build trust and interest in our clients. A school presence will enhance our credibility, students will spread our ideas to adults and companies want to be in schools. Our advertising model provides motivation. There’s always a reminder to buy from the environmentally positive, an easily verifiable plus and necessary reward for well-behaved companies and the environment. Our clients, in return, will provide their goods and services as reward or prizes to schools and website contributors. Prizes will be collected or viewable at our sponsors and it will drive extra traffic to their premises. The joy of winning our clients’ goods and services will be alloyed with environmental emotion making the advertising particularly effective. The store promotion and school presence all direct traffic to our website where there’ll be ongoing opportunity to win prizes for visiting or contributing. The environment will be ever present in stories, tips and reminders to value the environment with purchasing decisions. Our clients will be the best behaved environmentally that we can find. Our methodology is a gentle introduction for the public to organically building interest and trust. Generosity and an academic presence will build credibility whilst entertainment will come, initially, from the store promotion and later from public contributions directed through suggestion and targeted competitions. We’ll maintain our independence via having multiple clients, and only endorsing their actions rather than them. The environment will demonstrably win from people’s purchasing switch whilst all associated with us, from client companies to politicians and the public will have needs and wants satisfied. Our advertising model has the necessary elements for a successful web campaign. Our clients will be part of something bigger, a relatable environmental movement that can change current realities. They’ll be associated with winning, entertainment and positive achievement. To succeed we need funding, suitable and sufficient client companies and attractive cards, toys and stories. We’ve trialed the toys and stories very successfully in schools. Teachers were enthusiastic about the possibilities for the curriculum based programs and the students went crazy over the toys and stories. The corporate response has been positive however we need to acquire more expressions of interest to proceed. A number of venture capitalists have shown interest but want “further progress” before they’ll invest. We believe that’ll come with more corporate commitment. Much of our efficacy derives from the “Meemoes” we base ourselves upon. Meemoes used to be invisible till pollution got in their hair. They’re the voice people hear which they think is their conscience, someone calling them or a special friend. This means Meemoes have a reason to care and a story about how they became visible. On all levels our environmental message makes sense and, in Meemoes, we have a powerful tool for education. Meemoes can’t be violent, they’re just a voice but, in telling their stories, they’re entertaining and educate in the gentlest way. We’re creating a number of channels to communicate from trading cards to our website and stories that complement our toys. Australian local government has shown an interest in our possibilities and the web will enable us to target messages specifically and locally. The entertainment possibilities are endless and all can be tailored to bear an effective message. We’re creating the economic incentives to foster change and providing the education to induce it on an individual level. Factor in the web and there’s little prospect of corporate cheating. The public will be eager policemen and our willingness to drop clients will enforce the message. Yes, we will value our clients but, with that, will come environmental obligations. Importantly we’re giving people what they want. They can feel good about their environmental contributions with minimal or no sacrifice. People like to win or be given things and it all encourages trust. Public behaviour will ultimately change due to social pressure and education and they’re interrelated. We go beyond the norm to carry the message and every revenue stream represents another potential channel to influence and change. For example: all merchandise such as our toys comes with a daily story. Since it’s based on creatures that used to be invisible till pollution got in their hair an environmental element is inevitable. Make it fun and that story will be shared in social groups. We aren’t about directly affecting emissions. Our mission is to enable the implementation of appropriate technologies and affect the social change necessary to complement it. There’s much goodness to follow but we are the missing first step that addresses the fundamental cause, human economic activity and drives. We use them to create a more sustainable form. It works regardless of political or economic winds because the rush to profit trumps both. Our solution has many moving parts because there’s no alternative. The possibility of simply saying: “buy environmental” has been destroyed by many years of advertising abuse. We’re trying to change the world and a sophisticated, multi-faceted solution such as ours addresses all facets of society. All need to buy in for maximum effect. We’ve designed Meemoes so as every facet has integrity on its own yet the whole is greater than the sum of its parts. Broken down each facet is self-supporting and has historical precedents. We’ve been able to show the elements work on their own. Individual motivation will be a combination of greed and/or altruism but it’s unimportant. All that matters is the world marches in the right direction. Toys are a boom and bust market and life expectancy can be a matter of weeks however we've a way round the problem. Toys such as Beanie Babies have acquired a life of their own and the gimmick that makes Meemoes toys and merchandise initially appealing might mean the same but we don't count on it. Humans are social animals and all Meemoe merchandise comes with a daily story delivered via web or mobile app. It gives owners something to share with their friends and owning will mean belonging. A social experience creates interest beyond the initial excitement, longevity, an opportunity for ongoing education and a space for our clients. Those stories will be provided by the toys’ and merchandise’s owners. They’ll do it because they want the world to see their contribution and our advertising clients will provide the incentives for them to contribute. In effect we’ll be a Youtube with prizes and it’s another way to achieve or strengthen the environment/market share connection. Like all of the project it will grow organically. The more people who look or own, the better the prizes so the more who’ll look so the better the… We anticipate Meemoes will become an icon for environmental concern and the merchandise and prizes will encompass all demographics. When we trialed the toys in schools, they appealed to all the students including teenage boys and women of all ages. All demographics post on the web, curate a social image and are interested in winning. There’s no reason to limit our idea to one age group. That’s merely where we start. It’s a mistake to envisage Meemoes as a “Kids’ Idea”. There’re many advantages to starting with kids from their natural enthusiasm to training a future generation but our clients will be as keen to expand to all demographics as us. Whilst the toys will appeal to one generation a trip on the most environmental airline we can find will appeal to another. 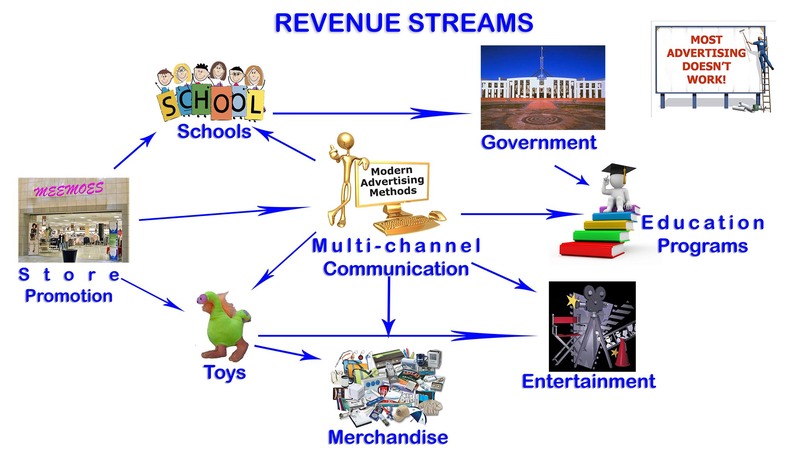 The graphic “revenue streams” hints at the possibilities of a Kids’ TV show and it’s part of our aspirations as are games and any appropriate channels. The daily story makes Meemoes a storyteller and a TV show would be a natural extension of their ability. The cost isn’t large to a world interested in profit because investments are predicated on that potential. We’ve had to design the idea to be profitable or there’d be little interest and no possibility of its propagation. Relatively speaking this idea’s cost is insignificant to governments and what is already being spent to solve the environmental conundrum. Good execution is, of course, vital. Get that right and, once launched, the project rapidly becomes self-sustaining. Most economic theory claims the market mechanism the most efficient arbiter of resources and outcomes. We use it to attain the best possible results for the environment. We’ve the team to bring our concept to market. Warwick Willcoxson is the creator, conceptualizer, developer and driving force. He studied Arts/Law/Science at Sydney University and University of NSW before dropping out to run his own successful jewelry company. He’s been in leadership positions long enough to recognize what he doesn’t know and when to ask or delegate. Dave Archer is an enterprise software and cloud platform specialist who’s been an unending source of good advice and guidance in all things web related. Jim O’Connor is a director of a superannuation fund and our logical brain. He brings an encyclopedic knowledge of corporate governance and shines a rational light on our creative inspirations. Professor Ian Goodwin is one of the world’s leading researchers in marine and climate science. His expertise and contacts within the scientific community have been and are a tremendous help identifying issues and areas of concern that need to be addressed. Peter Goodrich is an ex corporate lawyer. He alerts us to legal pitfalls and procedures that need to be negotiated or avoided. Gary Tilley is the current Australian teacher of the year. He’s given us invaluable insights into teaching and the school system and is helping us develop our school programs. Children love the toys and are environmentally aware. Our initial promotion starts with them and they’ll convey shopping preferences and our environmental credentials to their parents. Parents will discover our website through their children and spread the word to other adults. The Public will achieve the desired market share = environment connection by their involvement and be rewarded with our corporate sponsor’s/advertisers goods and services. The Corporate World will provide promotional materials and be rewarded with enhanced market share and image. Politicians and Governments will gain by association and we expect our ability to communicate with the general populace will be of use to them. Talks with local government and members of Parliament in Australia has confirmed this view. Our work thus far has been in Australia however the concept can transfer readily any technologically advanced society such as the Americas, Europe or parts of Asia. These areas, coincidentally, are the major contributors to greenhouse emissions. Where we launch is flexible but it'll probably be Australia due to convenience and familiarity. Where we go after that will be determined by opportunity and funding. Less developed areas such as sub Saharan Africa will need a modified version due to the lack of internet access and smart phones however we can work with the semi-smart phones of the areas and the principles of reward, belonging and caring are universal. We claim no direct carbon benefit yet the benefits of changing economy’s direction and educating the attitudes and habits of the public are incalculable. Human greenhouse emissions are almost all a consequence of economic activity and/or lifestyle choices. Our lack of a satisfactory response to climate change is a direct result of human nature and the economic system we’ve created. There’s resistance from the public to anything that threatens their lifestyle. Politicians are wary of that reality and profits, thus far, have dictated a tardy corporate response. These problems can only be overcome by working with human nature. There’s no pain in switching purchasing decisions however people need to be convinced they should. Economies, countries and people are motivated by profit and, if market share is going to the environmentally positive, maintaining that image will become an essential part of manufacturing, marketing and investment. There’s already a movement toward such behavior. Making the environment = market share connection will turn it into a raging torrent and create the environment necessary for beneficial technologies to flourish. The other essential part of modifying human behavior is education and that’s implicit in our concept. A visit to the website, toy or any of the channels we may ultimately utilize will all have some subtle, easily digestible pearls. A very positive byproduct is we teach people to solve problems non-violently. Our concept is based on creatures that are the voice you hear that you think is your conscience, a special friend or someone calling you. The creatures can talk, finish sentences, confuse you with whispers or make any sound. They can’t physically affect anything. Thus they solve all problems verbally. If people want to contribute and win they must do it with their wit. There’ll be no blowing things up or hitting. This only sounds hard till you realize comedians have been solving problems in such a way for years. On a local level, we can tailor our message to suit any local goal as we'll know the location of all visitors to our website. The projected cost of bringing our project to market is $350,000 - $800,000. The disparity is due to the great unknown of marketing and whether we have the finance to protect our IP internationally as this is a trans national idea. The lower figure gets us to market without the legal protection we'll inevitably need. Once we reach the market costs in each new market will be contingent upon the size of the initial promotion and the deal we manage to strike with our initial clients vis a vie payment schedules. Our promotional activities will do nothing to reduce consumption, that’s the job of the education program that comes with it, however, because we’re substituting our product for another, the net effect should be neutral. Initially we won’t even be able to source our toys sustainably due to the demands of our clients however that’ll change as our reputation and cash flow develops. The major challenge will always be getting people interested in each new market, understanding and adapting to the culture and financing our entry into that market. Interest will grow upon previous success and finance become easier however the culture and adaptation to it will always be a challenge as will finding good people to work with. Nothing happens immediately but it can happen quickly. Our timeline graphic quantifies financial returns and the state of the business but not its achievement. We can quantify the time it’ll take to get to market (6 months). We can launch anywhere in the world however it’ll probably be Australia, partially because of our familiarity with the market, but also because the dominance of the supermarket space by two major players presents a unique opportunity. Australia is a classic example of a country with politicians not addressing climate change whilst occasionally paying lip service to the problem and large per capita emissions. Our spread to other parts of the world will be contingent upon capital. The more we have the more rapidly we can expand. Our education program starts the moment someone receives their first swap card when we launch and continues in schools and on our website. It will be ongoing as long as the business exists. Our making the environment = market share connection will occur in the timeframe it takes for our marketing campaign to be successful. As soon as our clients’ success becomes obvious to their competitors the environment will be something they can’t afford to ignore. We expect to, ultimately, have a presence in most major industries. We’ll have interest in anywhere where the success of one will force others to change their behavior or be left behind. Beyond out own research we’ll rely on the feedback of the public. Their willingness (which is regularly demonstrated) to report underperforming companies will be crucial in our drive to maximize environmental gains. Attempts have previously been made to make the market share/environment connection without success because they failed to observe the necessary fundamentals. Success is impossible without Independence, Public Trust, Entertainment and Wins for the environment (preferably everyone). Public trust won’t be won without independence, integrity and more. No one will look unless it’s entertaining and there will be no pubic buy-in unless there’re gains for the environment. Our model meets these conditions and exploits the strengths of the internet and our economic system for maximum environmental effect. Longer term we’re creating an entertainment property and, within the entertainment, there’ll be an ongoing education contained within the stories and merchandise. It’ll form attitudes and influence actions because it’ll never be more than incidental to the entertainment. Warwick Willcoxson had an epiphany whilst recovering from a motorcycle accident and, afterwards, searched for a positive avenue to utilize his talents. The problems of climate change were obvious to him by the late 80s and he began to develop a way to address the problem. His education (Arts/Law/Science) meant he could see no solution was possible without addressing the human drives that have caused the problem in the first place, a Confucian approach and solution. It was obvious that every major social force was allied against effective environmental action so the quest became how to make it in their interest to work for the environment. His business experience has added a layer of practicality and this is the result. There are many more however space prohibits their mention.